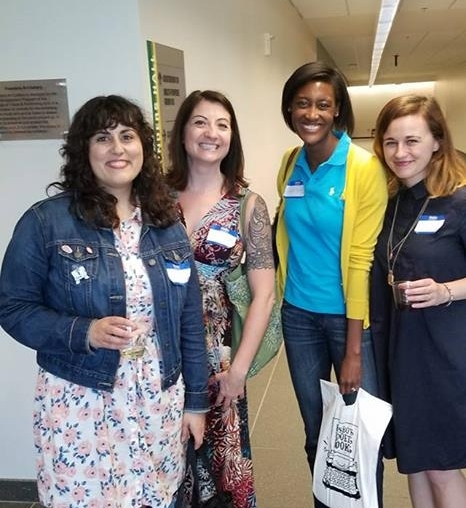 Conversations and Connections is a one-day writer's conference at George Mason University in Arlington, VA that brings together writers, editors, and publishers in a friendly, supportive environment. WHAT IS CONVERSATIONS AND CONNECTIONS? A whole lot of stuff! For your $75 registration fee, you get the full day conference, including the keynote by featured authors keynote discussion, and 3 craft workshop/panel sessions, plus 1 ticket for Speed Dating with Editors, your choice of 1 of the 4 featured books, 1 subscription to a participating literary magazine, and (for those of you 21 or over) our world famous Boxed Wine Happy Hour. Boxed Wine Happy Hour! Conversations and Connections is organized by Barrelhouse, a nonprofit literary organization. Exactly one half of every $75 registration goes directly to the participating literary magazines and small presses. After expenses, the rest goes to Barrelhouse to support printing costs, paying writers, and other community projects like the Barrelhouse Amplifier, a $1,500 cash award for emerging literary organizations. Honestly I haven’t been to a better, smarter, nicer conference. Want to write better? Want to get published, or take your writing and publishing to the next level? Attending pricey, academic-style, lecture-hall writer’s conferences won’t quite get you there, no matter how good the bagels are. Here’s what will: a comfortable, congenial environment where you can meet other writers, editors and publishers. You need to speak with the people who make editorial decisions, as well as with others who are trying to perfect their craft, just like you. You’ll find this at Conversations & Connections, a conference devoted to giving you practical advice on getting published. Since 2007, Conversations & Connections has been a top-pick among writers in the DC, Philadelphia, and Pittsburgh areas: 2019 marks our twelfth conference in the DC area. Barrelhouse Nonfiction Editor Tom McAllister, Art Director Killian Czuba, and Fiction Editor Joe Killiany at Conversations and Connections Pittsburgh 2016. Conversations and Connections is organized by Barrelhouse, an all-volunteer literary nonprofit that produces a biannual print magazine and manages a small press that prints several books each year. Barrelhouse also manages a vibrant website constantly updated with new poetry, prose, and essays, as well as book reviews and literary ephemera, and the podcast Book Fight. Barrelhouse also manages this conference in Pittsburgh in the Fall and DC in the Spring, as well as the writer's retreat Writer Camp. The 2018 conference will be the fourth in Pittsburgh, and our Spring 2019 conference will mark twelve years in DC. In 2016, Barrelhouse created the Barrelhouse Amplifier, a $1,500 cash grant to emerging literary organizations that is sponsored by Submittable. The first recipient of the Amplifier was Girls Write Pittsburgh, which empowers teen girls in the Pittsburgh area to find their voice through creative writing. The second Amplifier recipient was Fiyah, a magazine of black speculative fiction.